Problems with the disposal of used tyres? Nowadays a professional disposal of waste becomes more and more important. In particular the disposal of used tyres requires a great deal of high professional competence. This is why it is important to find the right partner. Reifen Heyer is a professional specialised company for the disposal of used tyres. We dispose of your used tyres in an unobjectionable and lawful way. According to requirements, we will sort your tyres correspondingly and pass them to material recycling. Our company is our clients' professional and reliable partner in the disposal of used passenger car tyres. Because of our own HGV fleet, we can ensure a smooth disposal on schedule in the area of Thuringia, Saxony, Saxony-Anhalt, Hesse and Lower Saxony. For sorting and processing we operate a sorting facility for used tyres at our domicile in Muehlhausen. We will happy to provide you with a detailed quotation! You want to sell used tyres? You are looking of a competent buyer for your used tyres and carcasses. 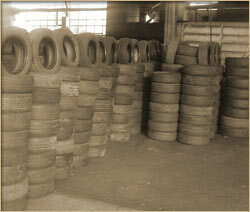 Our company is a professional and reliable partner for our clients in the field of used tyres and carcasses. For a smooth transportation on schedule, an HGV fleet of our own will be at your service. According to the German Waste Avoidance, Recycling and Management Act, used tyres are in need of supervision and tracing. This is why you, as producer, have to provide evidence of the whereabouts of the tyres. Years of experience provide us with the neccessary knowledge to dispose of your used tyres according to law. Unauthorised disposal is a risk too big to bear! We are able to respond quickly to your requests and wishes, because we are situated centrally in Germany. As we have built up good contacts all over the world, we have a global delivery market and export into the foreign countries of Europe, Asia, Africa and the US. In case we havn't established a business contact yet, you are very welcome to order our purchase list or to simply contact us by phone at +493601/4039506 or +49171/5256964.